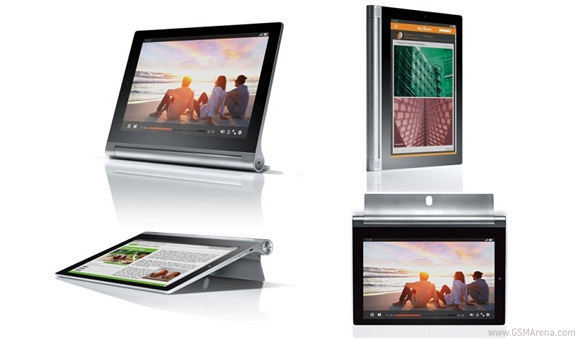 The new generation Lenovo Yoga Tablet 2 family also comes in 8" and 10" versions, besides the gadget-packed 13.3" Pro version. The 10" model has a Windows 8 version as well as an Android one, while the smallest 8" model is Android-only. The IPS LCD screens of the 10" and 8" models both have 1,920 x 1,200 pixel resolution, lower than the QHD screen of the Pro model but still fairly sharp in tablet terms – 226ppi and 283ppi respectively. The two tablets share in other specs too – like an 8MP f/2.2 auto-focus camera on the back and a 1.6MP selfie camera. They have 16GB of built-in storage and support microSD cards up to 64GB, plus you can attach USB On-the-go for more storage or accessories. The connectivity includes dual-band Wi-Fi b/g/n, Bluetooth 4.0 and optional LTE (available only in some countries, but not in the US). The 10" Lenovo Yoga Tablet 2 measures 255 x 183 x 3-7.2mm and weighs 619g. The 8" model is 210 x 149 x 2.7-7mm and weighs 419g. The two tablets are available starting today at €230/$250 for the 8" model and €300/$300 for the 10" model. The 11e is looks interesting as well. Yoga 3 just come out - looks pretty good, but $1600! Ouch! !